This article first appeared in the Rushville Republican on July 11, 2017. Through a grant from the East Indiana Area Health Education Center (AHEC), the Rush Memorial Hospital Foundation was able to develop an internship opportunity partnering foundation work and hospital clinical experience. Rush County native Katie Meyer came on board the RMH Foundation in November of 2016 through June 2017. Katie, now graduated, was a business major with a certification in Drug and Alcohol Addiction Counseling. 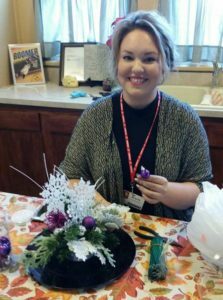 Her goal in this internship experience was to work primarily with the RMH Foundation, but experience the tie between the Foundation and Rush Memorial Hospital. Part of Katie’s experience included chairing fundraising committees, attending workshops and meetings, preparing and giving health presentations, shadowing clinical areas, assisting with hospital projects, learning the day to day running of the RMH Foundation, working on updating procedures, public relations, and more. Katie will now be sharing her experience at an upcoming AHEC board meeting and speaking with other hospital foundations that may be interested in this type of program. For more information about the Rush Memorial Hospital Foundation contact the office at 765-932-7568. Faith Mock, Executive Director or Mary Frances Friedl, Administrative Assistant, will be glad to answer any questions for you.